Classic Industries offers a wide selection of Body Panels for your Chevrolet Bel Air. Classic Industries offers Chevrolet Bel Air Door Shells, Chevrolet Bel Air Door Skins and Panels, Chevrolet Bel Air Fiberglass Door Shells, Chevrolet Bel Air Door Frame, and Chevrolet Bel Air Door Jamb Lock Pillar. Repair panel that replaces only the lower half of the door skin. 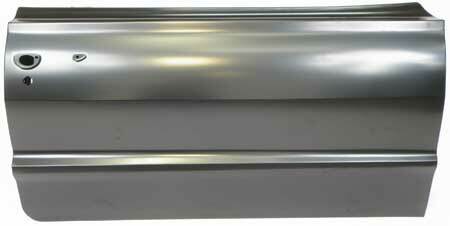 Overall dimensions are 47"L x 23-1/4"W. Fits all 2 door 1955-57 Chevrolet models. Made in the USA. Note: Shipped oversize. Reproduction door and side window access hole cover sets for 1955-57 Chevrolet convertible models. Each set includes six pieces. Reproduction door and side window access hole cover sets for 1955-57 Chevrolet 2 door sedan models. Each set includes six pieces. Reproduction door and side window access hole cover sets for 1955-57 Chevrolet 2 door hardtop models. Each set includes six pieces.